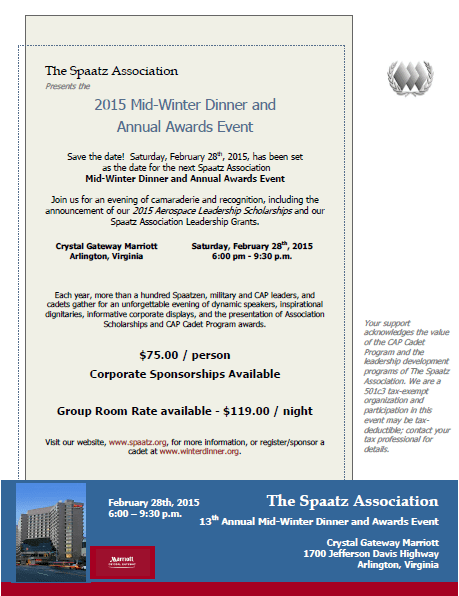 Have you registered for the 2015 Mid Winter Dinner yet? If not, now is the time…and you can book your room at our group rate of $119.00/night. Click to access our group room rate at the Crystal Gateway Marriott! Click to download a PDF of this flyer suitable for printing and posting in your squadron. NOTE: Pre-paid and special rates may be available that are lower than the Association’s group rate. We recommend you check Marriott.com for the lowest possible rate before booking.